A Companion to Pragmatism, comprised of 38 newly commissioned essays, provides comprehensive coverage of one of the most vibrant and exciting fields of philosophy today. - Unique in depth and coverage of classical figures and their philosophies as well as pragmatism as a living force in philosophy. 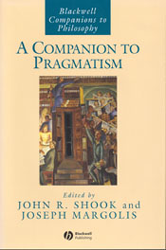 - Chapters include discussions on philosophers such as John Dewey, JÃ¼rgen Habermas and Hilary Putnam.